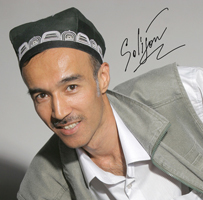 Was born on June 22, 1966 in Asaka (Uzbekistan). Graduated from the Moscow State Pedagogical University, Faculty of Philology, and Tashkent Art College, department of painting. Worked as a designer in Tashkent until 2007. The first caricature was published in the Uzbek satirical magazine “Mushtum”. He took part in many international cartoon contests. Artist-designer of LLC “VADES GROUP”. Member of the Creative Association of the Academy of Arts of Uzbekistan.